Sub: School Education- Minority Cell - State Awards to the Teachers for the year 2018 - Submission of Proposals by the District Selection Committee - Extension of timelines - Regarding. 1.G.0.Rt. No. 434 Education (Ser. IV) Department, dt: 23.08.2000. 3. G.O.Rt.No. 500 Education (Trg. I) Department, dt: 02.09.2002. 4. Procgs.Rc.No.126/MC/2018, Dt:17.07.2018, of this office. In continuation of the Proceedings even. No. 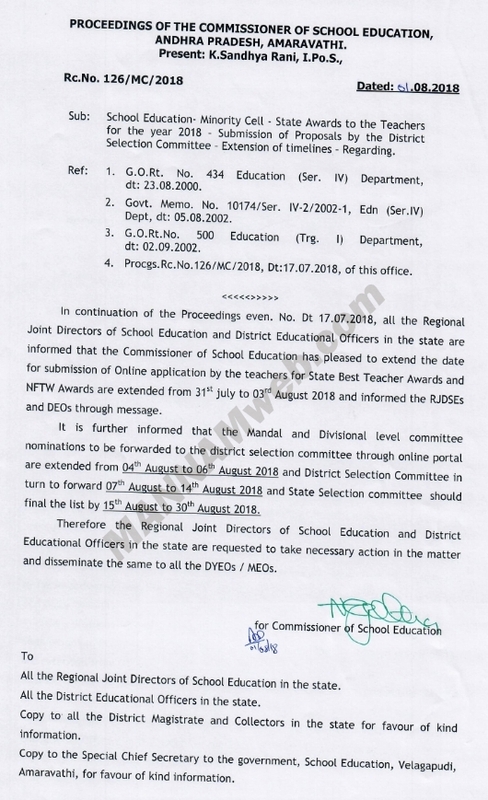 Dt 17.07.2018, all the Regional Joint Directors of School Education and District Educational Officers in the state are informed that the Commissioner of School Education has pleased to extend the date for submission of Online application by the teachers for State Best Teacher Awards and NFTW Awards are extended from 31st july to 03rd August 2018 and informed the RJDSEs and DEOs through message. It is further informed that the Mandal and Divisional level committee nominations to be forwarded to the district selection committee through online portal are extended from 04th August to 06th August 2018 and District Selection Committee in turn to forward 07th August to 14th August 2018 and State Selection committee should final the list by 15th August to 30th August 2018. Educational Officers in the state are requested to take necessary action in the matter and disseminate the same to all the DYEOs / MEOs.